Supply chain cyberattacks — where products are compromised during the manufacturing process — have surged over the past few years. This threat is particularly dangerous to higher education institutions, which store valuable personal and financial information and other sensitive material. In a global marketplace filled with contractors and subcontractors from multiple countries, higher education officials must demand strict security across the supply chain from their IT suppliers. 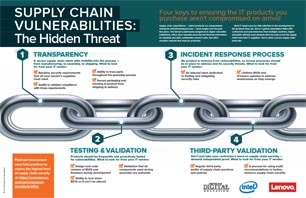 Download this infographic to learn what a secure supply chain looks like and the four keys to ensuring the IT products you purchase are compromised on arrival.